We admit that this salad is a bit of a guilty pleasure – after all, there are cookies in it! – but we’re firm believers that chocolate has a place in the center of the plate. 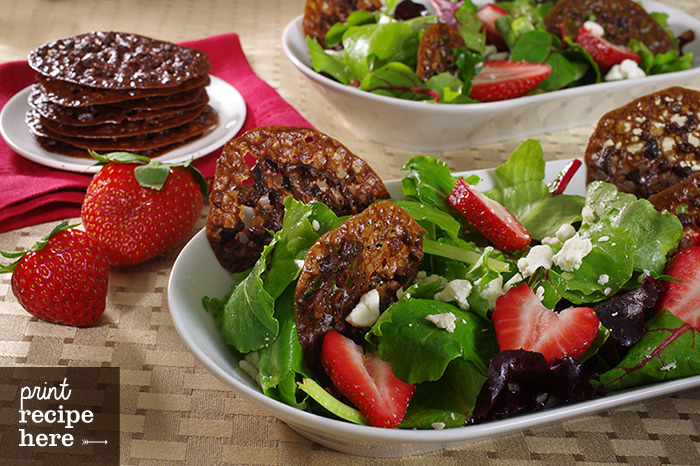 We love the contrast of the sweet, crunchy cookies with the sharp dressing, tender strawberries, and tangy goat cheese. 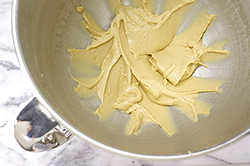 Note that this recipe makes a lot of Lacy Nibs, but any fewer and the batter would be too difficult to mix. They’re so delicious through, you’ll be glad to have extra to snack on. This dish would be supersweet for a special Valentine’s meal. 1. 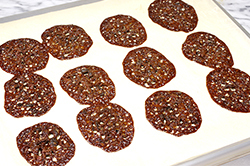 To make the cookies, preheat the oven to 400 degrees F. Line a baking sheet with parchment paper and set aside. 2. 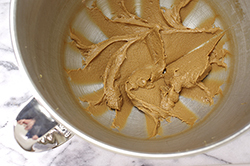 In the bowl of a stand mixer fitted with the paddle attachment, cream the butter and brown sugar together on medium speed until smooth. Scrape down the sides of the bowl, add the milk, and blend until smooth. 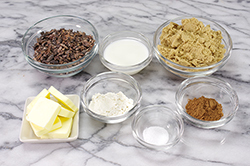 Add the flour, cocoa powder, and salt, and mix well. Fold in the cocoa nibs. 3. Using a 1/2 teaspoon measuring spoon (yes, so tiny!) 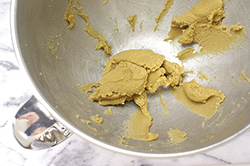 drop the batter onto the prepared baking sheet, 3 inches apart. 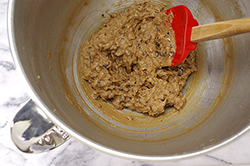 Bake until the entire surface of each cookie is bubbling, about 7 minutes. It’s perfectly fine if they run together – you can snap them into smaller shards for serving. 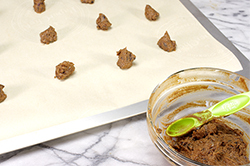 Let the cookies cool completely before removing them from the parchment paper. 4. 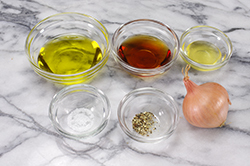 To make the salad, in a large bowl whisk together the vinegar, shallot, honey, salt, and pepper to taste. Whisk in the olive oil Add the greens and toss to coat the leaves with dressing. Add the strawberries and toss again. 5. To serve, divide the salad among 4 small plates. Top each salad with a quarter of the goat cheese and 3 of the cookies. Serve immediately. Reprinted with permission from Theo Chocolate, Recipes & Sweet Secrets by Debra Music & Joe Whinney. Copyright 2015. Published by Sasquatch Books, Seattle, WA. All rights reserved.